DroidEFB - Fly with Android! DroidEFB 2.5.2 now available for download on your Android device! 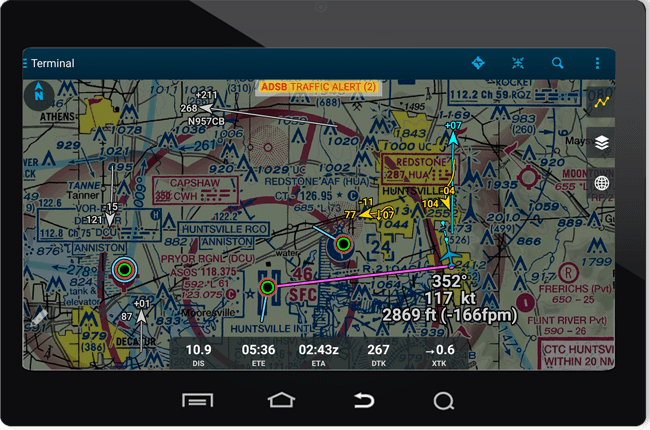 Pilots now have an excellent aviation navigation and flight planning app for their Android devices. DroidEFB is a flight planning and in-flight support application comprising a comprehensive suite of tools for general aviation and professional pilots: en-route GPS navigation via moving map, interactive charts, NEXRAD radar, aviation weather, chart supplements, approach plates, ADS-B capability and much more. 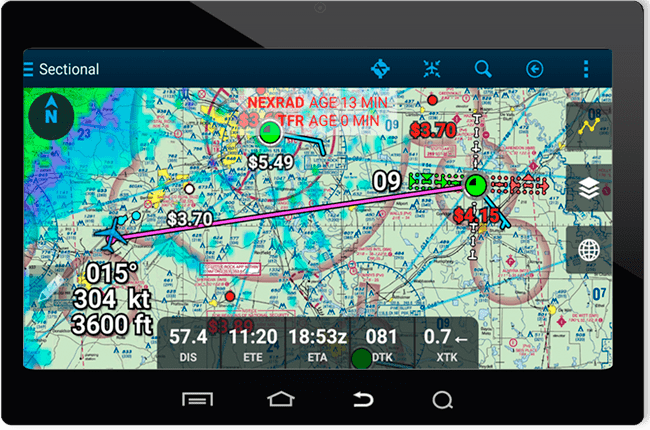 DroidEFB provides the best value in aviation navigation for Android tablets and smartphones and matches many features found in the ForeFlight® app, which only runs on Apple’s more expensive mobile devices. For more information on features and benefits of DroidEFB, please click here. Flight Test DroidEFB – 30 Day Free Trial! Premium Yearly Plan for $149.99 per year. Approach plates & airport diagrams are geo-referenced. DroidEFB is an aviation navigation app that runs on Android, the world’s most popular mobile platform. In the air, this Electronic Flight Bag (EFB) displays your current position and flight plan onto an aviation chart (US only at this time) along with weather information (NEXRAD, winds, PIREPs, SIGMETs, AIRMETs, TAFs, and METARs). On the ground, tools like weight & balance and flight planning support pilots in their preflight decision making. DroidEFB introduced ADS-B capability to take advantage of real-time traffic and weather as part of the NEXTGEN aviation system.